I only had to start wearing uniform at secondary school (age 11+). Up to the sixth form (16-18) I wore a grey skirt, blue shirt (not a blouse), tie and acrylic V-necked jumper. We had to ask permission to take off our jumpers on hot days. 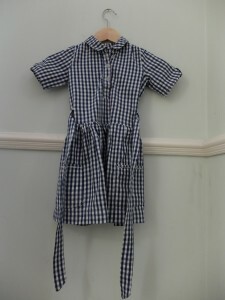 At the start of the summer term, in May, boys were permitted to leave off their ties, and girls got to wear a gingham blouse with a rever collar. I loved my blouse. I wore it constantly, even on holidays. 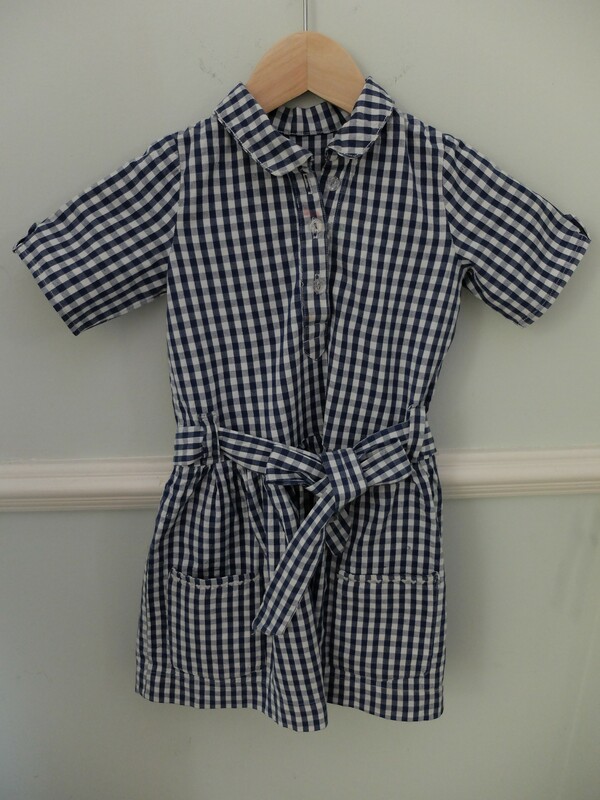 I craved the gingham and plaid dresses worn by the girls on Neighbours and Home and Away (Australian soap operas), and daydreamed about this one day becoming an option at school. 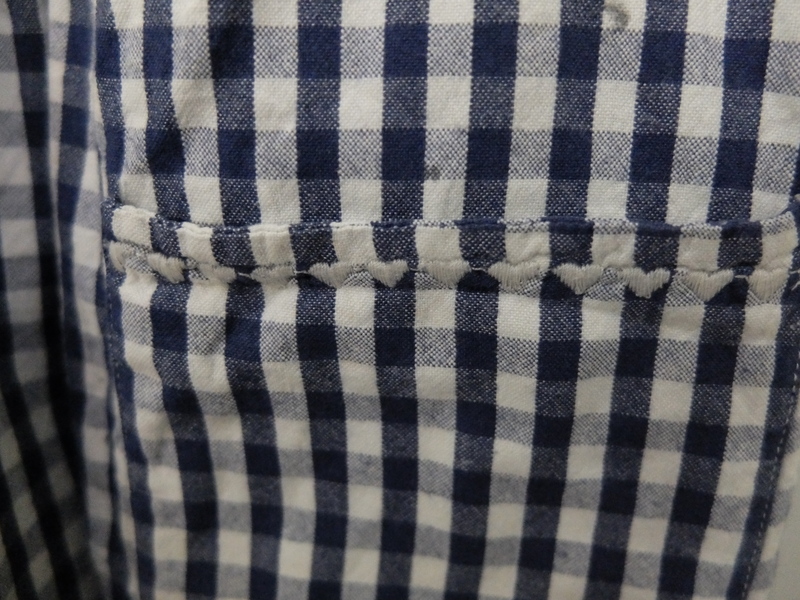 Sadly it wasn’t to be and even when I started sixth form, and switched from grey to blue, the gingham blouse remained the only summer option. 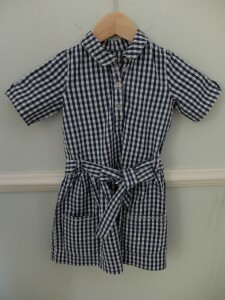 So of course, J’s first handmade school frock had to be a gingham dress. I chose handloom gingham from The Organic Textile Company for this. I was taken by the photos of Ganesh, who weaves and grows the cotton. In particular, his family, including his children, can wander about the fields without risking long term health problems caused by the remorseless application of pesticides regular cotton requires. I chose a digital pattern – the Jump Rope Dress from Oliver + S. The worst part, without a doubt, was taping together the pattern pieces after printing. 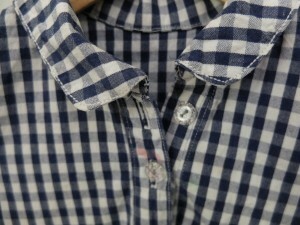 The second worst part was the placket, or the bit that holds the buttons on. This involved a lot of fabric origami, folding and snipping and sewing. I’ve made a placket before and that time, I used disappearing fabric marker, the kind that vanishes when you iron it. Since there’s a lot of ironing involved in making a placket, I realised that this was quite a stupid idea. So for this one I marked the folds by stitching along the lines, which was much more effective but the stitching was a sod to remove and indeed, you can see that I gave up trying to. 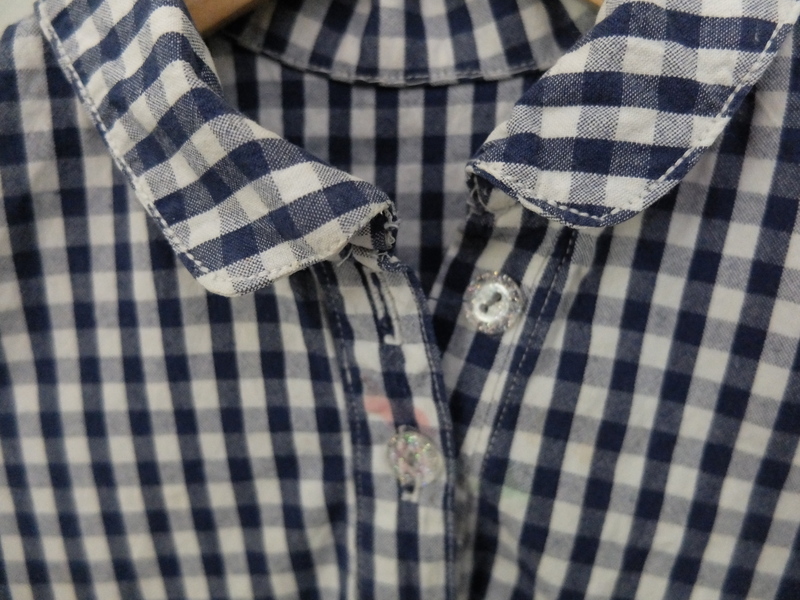 Sparkly buttons and a reasonable stab at a placket. The clear sparkly buttons were from John Lewis. My husband had conniptions about both the buttons and the little embroidered hearts, saying that they would not be up to regulations. I reasoned that if the school tolerated Hello Kitty appliques on uniform, they could live with sparkly buttons. My machine has about 50 stitches I never use, it seemed rude not to. There are only two belt loops. The pattern asks for four, but making them was quite boring and I thought I’d chance my arm with just two. I have recently found a tutorial for simpler belt loops from Coletterie, which I’ll try next time. The sash has, so far, returned from school with the rest of the dress. This looks a weird shape. It’s not, it’s just my l33t photography skills. This is her favourite dress and she will wear it for formal occasions if not persuaded otherwise. The material is thick, but light, and has washed really well. It’s soft and comfortable. 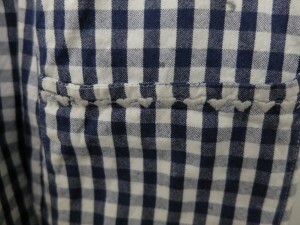 Most gingham dresses I’ve seen have a collar with facing, and this always turns out to the front without painstaking ironing. Almost nobody, not even I, can be bothered with pressing fiddly collars – the Jump Rope dress has no such annoyances. Indeed, by my standards, it doesn’t need pressing at all. J’s only real objection was that she felt the blue was too dark and the checks too big at first. She was worried she’d get into trouble. However, this is a reception class at a local state infant school and nobody is about to check her gingham with a ruler and a Pantone chart.